The City of Hayden is a great place to relocate or start a new business! Working in partnership with both the Coeur d'Alene Area Economic Development Corporation and the Panhandle Area Council, the City is aggressively looking to expand its commercial base focusing on everything from light industrial to retail-based industries. Centrally located among many modes of transportation, Hayden is a place where businesses can enjoy a small town atmosphere while benefiting from the amenities of a larger metropolitan area. The Coeur d'Alene Airport resides adjacent to the City limits and offers organizations an affordable alternative for transporting goods and services. Interstate 90 is located just five miles south of the Community and the Union-Pacific railroad has stations located within just 45 minutes. 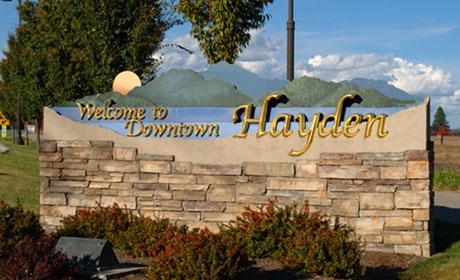 If you are interested in learning more about business opportunities in Hayden, please contact Brett Boyer, the City Administrator, at (208) 772-4411 or Gynii Gilliam, President of Coeur d'Alene Area Economic Development Corporation at (800) 621-5600. Come see why Kootenai County is one of the fastest growing counties in America!